Guatemala, like many developing countries in the tropics, continues to destroy pristine, old growth forests in exchange for opening up more land for cattle and agriculture. With an exploding population, high rates of poverty, lack of access to secondary education, and antiquated agricultural practices, Guatemala is facing all of the conditions for a “perfect storm” of deforestation and land degradation in the coming ten years. In the country as a whole, Guatemala continues to see rapid and increasing deforestation. The following statistics from the United Nations’ Food and Agriculture Organization: Global Forest Resources Assessment (2005 & 2010) portray a shocking reality. CCFC is working to bring attention to the plight of these endangered forests and forest fragments before it is too late. Map delineating deforestation in CCFC’s work area from 1986 to 2009 Map made by Ian Pope. Ian researched deforestation and cloud forest loss in the areas above 2,000 meters between the years 1986 and 2009. His results found that the rate of deforestation accelerated by the decade. The map: area of light green represents the area above 2,000m. The area of dark green represents presence of cloud forest in 2009. The area of red represents deforested cloud forest area lost between 1986 and 2009. Tropical forests cover less than 2% of the earth’s surface and yet are home to between 50% and 80% of the total species of the earth’s plants and animals. The vast majority of forest loss on earth over the last 50 years has been in the tropics. This means between 50% to 80% of the earth’s total biodiversity has been losing its home as the destruction of tropical forests continues apace. 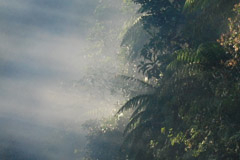 Cloud forests, a subset of tropical forests, like lowland tropical forests have very high levels of biodiversity. But cloud forests have a special status. While cloud forests are not quit as biologically diverse as low land tropical forests, they are much, much higher in the occurrence rates of endemic species. Endemism rates in cloud forests are higher than in any other forest type. *2 In other words, any given cloud forest, is very likely to be home to a plant or animal species that doesn’t live anywhere else on the planet except in that specific zone, region or area. Because Guatemala is a country rich in cloud forests, Guatemala is also a country rich in endemic species. In fact, “Guatemala has the highest rate of species endemism in Central America” and of all of Guatemala’s endemic species, 8.1% are threatened according to Convention on Biological Diversity. Within CCFC’s focus area, there are several species of tree frogs that have only ever been found in the cloud forest of one specific mountain. When these forests are lost, so are the species that live in them, forever. Deforestation in Guatemala threatens the treasure of our global biological heritage. This is where cloud forests really stand out in the grand scheme of things. Cloud forests are like natural water towers. When deforestation occurs in a cloud forest, the amount of precipitation is decreased, springs dry up and the climate is locally dryer and hotter. Deforestation also affects run off. A cloud forest functions like an enormous sponge. When there is a hard rain, very little water runs off. When the forest is removed and replaced by a cattle pasture or a corn field, the water runs off directly. Studies have been conducted on the absorption value of different kinds of forest types and land cover. Cloud forests have a much higher absorption capacity than other types of forest. That water is what percolates down to recharge springs. When the forest is lost, the absorption capacity is also lost. Hard rains create rapid runoff, flash flooding*3 and landslides*4 That means less water percolating down to recharge the springs. Cloud forests catch the rain and release it slowly. *4 To learn more about cloud forests and water see above.